The sudden death of billionaire landowner and philanthropist the Duke of Westminster means his 25-year-old son Hugh has now inherited an estate worth £9bn. Hugh Richard Louis Grosvenor, previously known by the honorary title Earl Grosvenor, has so far kept out of the glare of publicity that once contributed to his father becoming affected by depression. But he attracted headlines after throwing a lavish 21st birthday party for 800 guests - dress code "black tie and neon" - which has been estimated at costing £5m. The seventh Duke of Westminster studied countryside management at Newcastle University. He works as an account manager for Bio-bean - a green technology company which recycles waste coffee grounds into advanced biofuels and biochemicals. He was the youngest and wealthiest person to be asked by the Duke and Duchess of Cambridge to be godparent to Prince George, in 2013. The duke attended a state primary before going to a private day school close to his home in Cheshire, and then Ellesmere College, a boarding school in Shropshire. 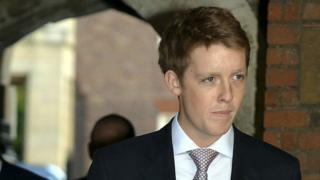 He becomes the new Duke of Westminster as the eldest male descendant of the late duke. He has two elder sisters - Lady Tamara Grosvenor and Lady Edwina Grosvenor, who is married to historian and television presenter Dan Snow. His younger sister is Lady Viola Grosvenor. His mother Natalia, Duchess of Westminster, is one of the Duke of Cambridge's godparents. Along with his title, the duke inherits the family's country seat, Eaton Hall in Cheshire. The Grosvenor family has called the hall their home since the 15th Century. It was there at his 21st birthday party in January 2012 that comedian Michael McIntyre and the hip hop duo Rizzle Kicks provided the entertainment and Prince Harry was among the guests. It was also reported that guests who wanted to give a present were asked to add to his large wine collection. "The party was simply amazing - a birthday and a party I will never forget. It is the beginning of a new era in my life and I look forward to the challenges that lie ahead," the duke told the Chester Chronicle shortly afterwards. In 2013 Vanity Fair described him as "baby-faced" and "absurdly rich", while the Tatler List once declared: "Hughie's a Newcastle graduate with his own wine collection who goes wild for girls in neon." It added that after inheriting his father's estate he would "own half of London".